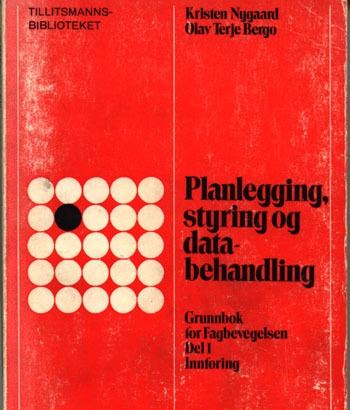 "Planning, Control and Data Processing. Basic Reader for the Trade Unions"
A memorable conference - "Software Development and Reality Construction" - was arranged at Schloss Eringerfeld in Germany 25-30 September 1988 by Professor Christiane Floyd and her colleagues Reinhard Keil-Slawik, Reinhard Budde, and Heinz Züllighoven. The conference was supported by the Technical University of Berlin and the German National Research Center for Computer Science, Sankt Augustin, and sponsored by the Volkswagen Foundation. You will find an account of some essential aspects of my work with the Trade Unions in: Nygaard, K., 1992: "How Many Choices Do We Make? How Many Are Difficult? ", pp. 52-59 in the Proceedings from that conference: "Software Development and Reality Construction", Floyd, C., Züllighoven, H., Budde, R., and Keil-Slawik, R., editors. Springer-Verlag, Berlin 1992. The paper is a reworked version of my lecture at that conference. I was very busy at the time, but Christiane Floyd insisted that I should write about some of the choices I have had to make as a scientist - choices relating to social responsibility.